It comes with a card reader with capacity of 5000. It comes with mini speaker for updates and communication is done with USB-host , TCP/ IP, RS 485. SF 100 is time and attendance machine with access control, it has great capacity of 1500 users along with the transaction storage capacity of 80000. 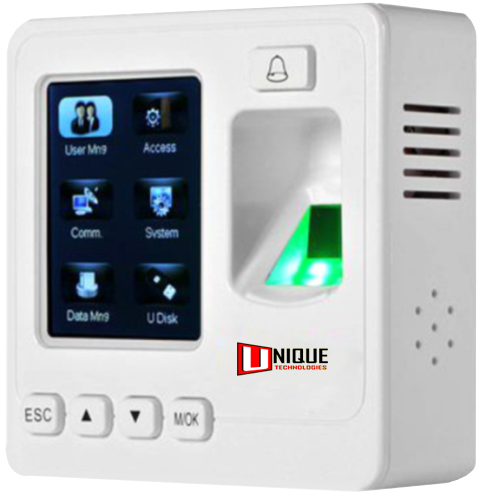 Biomax is one of the best companies dealing in Biometric solutions like Fingerprint and Time and Attendance, Biometric Time and Attendance, Biometric Attendance machine, Biometric Time Attendance and Access Control System, Face recognition System, Face Time Attendance System, Facial Time Attendance Machine, Face based time attendance and access control system, Card based time attendance System, Card based time attendance system, card based attendance machine, card based attendance machine seller, Card based attendance machine supplier, Palm reader, Vein reader, palm reader machine for security purpose, Vein reader for more security, Aadhaar based machine, aadhaar based attendance machine, UIDAI approved attendance machine.